We want to apply extreme value theory to the maximum yearly temperatures. Before we choose the model we want to test whether or not we can assume independence. 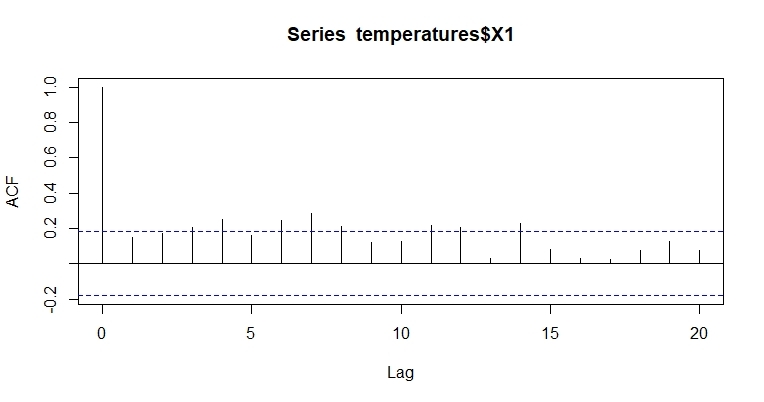 First we made a plot of the autocorrelation function: acf plot. Thereafter, we applied the Ljung-Box and/or Box-Pierce test. However we find that if we only include one lag, there is no statistical evidence of dependence on the 5% level (our p-value is about 0.1) but if we include 2 or more lags, the p-values are significantly lower than our significance level. Can anyone help us understand what we can conclude from these results? It is difficult to answer your question without actually looking into the data not just reflecting on summary statistics like the acf/pacf. To correctly use and understand a statistical test one has to know the assumptions underlying the test ( see A. Wald https://medium.com/@penguinpress/an-excerpt-from-how-not-to-be-wrong-by-jordan-ellenberg-664e708cfc3d !) . The two tests that you mentioned both requite that the process under evaluation does not have any Pulses, Level/step shifts , seasonal pulses and.or local time trends. Furthermore the process needs to have a constant error process over time. If you post one of your examples I will try and help. If your data is confidential then I might be able to help offline. Not the answer you're looking for? Browse other questions tagged r hypothesis-testing correlation autocorrelation acf-pacf or ask your own question. Can I trust a regression if variables are autocorrelated?